There are many occasions where you might need a boutonniere. Some of them are weddings, proms, parties, and other social events. Boutonnieres are worn by men and simply are a scaled down version of a corsage. The carnation makes a wonderful boutonniere. It's always available and always beautiful and comes in a wide variety of colors. You can also have the flower sprayed to match fabrics and themes. Making a carnation boutonniere is so easy, once you know how you'll be making them by the dozen. Some people use silk carnation flowers and they look as lovely as fresh, it's all up to you. Follow the steps below and make your carnation boutonniere. 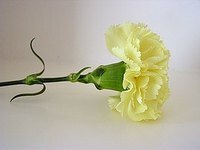 Take the carnation and cut the stem to about 2 inches below the flowers head. Gather the leaves and place in your hand, put the carnation on top of the leaves, and the filler flowers on top of the carnation. Make sure all the stems are about the same length and wrap securely with a piece of floral tape. You can make minor adjustments if you need to by simply pulling in the direction you want the leaves or flower to move to. Once it looks to your satisfaction you're ready to stick a pin the the taped stem part and you're done! Remove the pin from the stem of the boutonniere when ready to put on. Usually the boutonniere's are placed on the top wide part of the lapel on the left side of the suit or tuxedo. With one hand hold the boutonniere on top of the lapel and slip a couple of fingers under the lapel so as to isolate it from the suit. You want to pin the flowers only to the lapel and not the suit under it. Push the pin gently but firmly through the bottom of the boutonniere stem catching the lapel underneath it. Keep pushing, while guiding the pin through the lapel then back again a little higher up and back through the top of the stem, hiding the end of the pin in the floral tape on the stem.